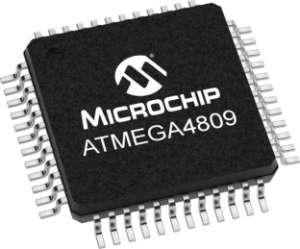 The Microchip ATmega4809 is the first 8-bit megaAVR® MCU to combine Core Independent Peripherals (CIPs) with intelligent analog to enable highly-responsive command and control applications. By executing tasks in hardware, instead of through software, ATmega4809 reduces CPU involvement. That means that less code is needed to implement control functions and fewer CPU interruptions mean faster response times and lower power consumption. As a companion MCU in complex MPU-based systems, or as a standalone processor in command-and-control applications, the ATmega4809 lets you to spend less time coding and more time creating. The dedicated Xplained Pro evaluation kit includes a socket for connecting sensors, actuators or communications interfaces from Mikroelektronika’s click boardsTM range.